This post has been updated on the 9th of August, 2018. Founded in 2004, in Ottawa, Canada, Shopify is one of the world’s leading e-commerce website platforms. 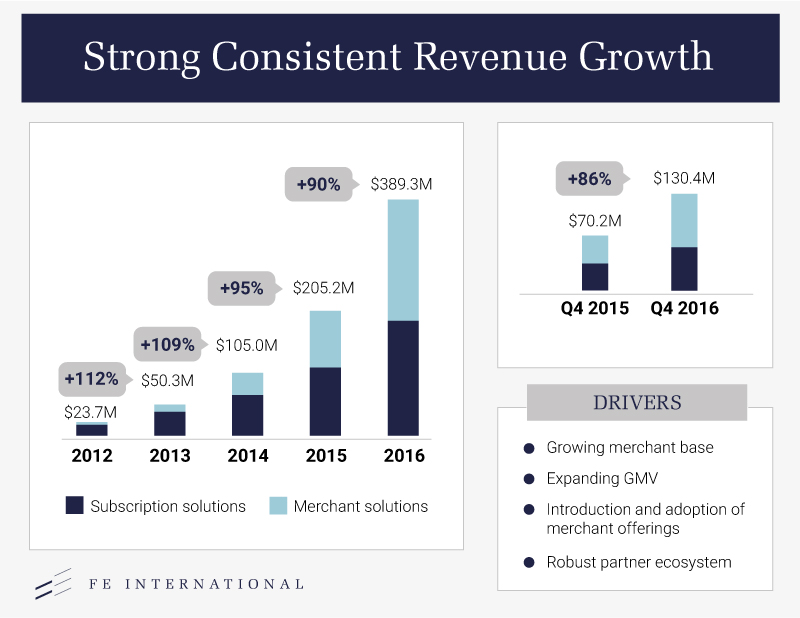 Over its lifespan, the platform has provided a foundation for 500,000+ merchants to sell over $40 billion worth of goods. These historical results, coupled with a study forecasting 8-12% revenue growth across the e-commerce industry in 2017, suggest that the future for Shopify’s 500,000+ merchants looks bright. The ease of setting up and running a Shopify business is a key component in its popularity. These same characteristics make acquiring a Shopify business an attractive proposition for buyers seeking to purchase successful companies that do not require much owner involvement. With experience in overseeing the sale of over 500 businesses, FE International has developed a deep understanding of what makes a valuable Shopify store. Our 20,000+ vetted buyers look for low risk, sustainable businesses with reliable sources of income. Here, the FE International team walks you through the steps to growing, marketing, and selling your Shopify business. In their own words, Shopify offers “a complete e-commerce solution that allows you to set up an online store to sell your goods, organize your products, customize your storefront, accept credit card payments, and track and respond to orders. A powerful promise and Shopify delivers; many highly successful businesses have been built on its back. Shopify lowers the barrier to entry for launching an e-commerce website to almost zero. From coding to hosting, Shopify offers a wealth of options for creating a personalized and unique branded user experience. Shopify allows merchants with virtually no technical knowledge to do what they do best–sell. By comparison, the basic Magento Commerce platform starts at $1,999 a month, rising to $3,399 a month for a more enhanced package. By default and design, Shopify facilitates Search Engine Optimization (SEO). Merchants are prompted to optimize their sites by creating unique URLs, meta descriptions, and page titles. All of this is done without employing one of the many available extensions to further enhance SEO. SEO aside, there are countless options available from the Shopify app store to further support merchant marketing efforts. Bold Commerce’s Recurring Orders is one compelling example. It enables customers to select products they want to buy on a recurring basis. That could be once a month or at any other user-defined interval. This fully Shopify integrated plugin enables the merchant to both charge the customer and process the order. This is only one of many available options enabling merchants to automate their sales processes. Shopify setup is simple – that is the platform’s Unique Selling Point (USP). If a merchant does run into problems, Shopify’s reliable support team can be depended on to offer a solution. There are countless Shopify partner agencies and developers worldwide enabling merchants to further develop, expand and optimize their stores. This one of many ways the ubiquity of the platform can be a plus. In today’s environment of hacks and data leaks, maintaining security is more important than ever. Shopify actively protects its merchants through regular security updates and add-ons. Some of the world’s biggest brands, including General Electric and Tesla, trust Shopify to take care of their business. Shopify is fully compliant with the Payment Card Industry Data Security Standard (PCI DSS). The standard is automatically applied to any Shopify store, ensuring customer data integrity. Site design is an integral part of both branding and user experience (UE). Shopify allows merchants to build and customize their sites through the Theme Store. The best themes may come at a price, but seamless integration with Shopify, and real-world testing from other merchants, can make them a bargain. With mobile devices quickly catching up to desktop computers in terms of consumer time spent online, it is important to know that all Shopify themes are mobile responsive. Outside of the official theme store, there are many third-party sites like ThemeForest, offering countless fully customizable themes. Merchant shopping carts and payment gateways are powered by Shopify by default. Depending on sales volume, this convenience may eventually come at a premium. Initially, Shopify compensates for this by minimizing the valuable time that might be spent configuring servers, enabling credit card payments and the myriad challenges inherent in building a custom e-commerce solution. Shopify may best all competitors when it comes to providing straightforward, intuitive tools for building a functional, well-designed e-commerce storefront painlessly and quickly. When further customization becomes a priority, this initial ease can come at a hefty price. Shopify uses their own proprietary language, Liquid, in coding. This means that any tweaks a merchant wants to make to a storefront that aren’t already accommodated for in their current template will require a proficiency for programming in Liquid. Few business owners will have the time or inclination to learn this highly specialized skill. Solution: Consider hiring a Shopify partner agency to assist in both setting up the store and maintaining and customizing the site as it grows. It’s an additional expense but a worthwhile one considering the alternative. There are thousands of add-ons available to enhance a Shopify store, but they can be expensive. These costs can add up quickly. Solution: There are many free or inexpensive extensions on the Shopify store. Do your research. Compare the cost vs. benefit of different extensions that address your business pain points. You may be able to find a cheaper alternative that achieves the desired results. This will lead to significant savings in the long run. There is one very compelling reason that has led to Shopify growing to be one of the biggest e-commerce platforms in the world: it’s very good at what it does. There is no doubt a well-run, fully optimized, and profitable Shopify business could be a very attractive proposition for buyers. Harnessing the full potential requires research and finding the right tools to add maximum value to the business. Shopify has a very active blog with an entire section dedicated to tips and stories on how to grow a Shopify business. A passive business is always going to be more attractive to buyers than one that requires extensive owner involvement and expertise. Closely examine all business operations and measure out how much time each process takes, as well as how much time the owner spends on the business. Improve efficiency or cut time spent without sacrificing quality wherever possible. Once the business is running smoothly, create Standard Operating Procedures (SOPs) for staff, contractors, and a potential new owner to follow. This is time-consuming, but it is time very well spent. It will increase the value of any successful Shopify store. If running the business requires more than 5-10 hours of owner involvement per week, outsource as much of this work as possible. Upwork and Elance are great starting points. Putting the right team together takes time and a considerable amount of trial and error. Cut down on both by creating clearly defined roles for each team member. There are tens of thousands of freelancers available at any given time across all disciplines. Quality team members can enable an owner to focus on growing the business, rather than getting bogged down with mundane, but essential tasks. Virtual Assistants (VA) can also be a viable alternative if the business isn’t at the stage where it requires a fully-fledged freelance team. VAs can help with repetitive tasks such as data entry or social media management. The whole point of outsourcing is to free up owner time and automate business functions wherever. This results in both a higher business valuation and a more attractive company to buyers. Owner time spent on a business is one of the key metrics used in valuing an online property. Monitoring Your Performance: Without hard data, how can a business or potential buyer gauge how it is performing? Monitoring performance will help identify the underlying strengths and weaknesses of the business which can then be addressed. Though this may sound obvious, many businesses simply fail to do it. Valuation: It is virtually impossible to accurately assess the true value of a business without accurate and up to date data. Traffic: As might be expected, Google Analytics is the go-to platform for monitoring website traffic, click-through, and conversion rates. Utilize and optimize its powerful reporting capabilities to create an accurate picture of customer traffic drivers. Shopify offers built-in Enhanced E-Commerce tracking. Working in concert with Google Analytics, this function builds out an even more detailed picture of customer behavior on the site. Accounting/Bookkeeping Plugins: There are dozens of Shopify extensions to aid in virtually all aspects of bookkeeping. Do some research to find ones that address the specific needs of the business. A good example is TaxJar — a popular tax automation software that can cut time spent on filing tax returns from hours to minutes. A great tool, but it does not work outside the United States at present. Holistic Reporting Apps: Many business owners like to have a complete overview of company performance all in one place. There are a number of options available for Shopify merchants that aim to meet this need. Semantics3 offer a tool specially designed for Shopify. It incorporates all of the data needed to monitor the performance of your business, and helps identify trends in customer behavior. Best of all, it’s free. There are multiple benefits to efficiently tracking business data, and with the right tools and smart implementation, it doesn’t require a significant amount of time. Once setup is complete, it is entirely feasible to let monitoring systems run in the background. An owner or CFO can just focus on action points and reports. Marketing is a necessity for any successful online business. As we discussed earlier, Shopify has many marketing tools built in, but there is always more to be done. Advertising: Highly targeted advertising campaigns are more accessible than ever, with Facebook in particular proving to be a lucrative source of traffic and revenue for some merchants. SEO: The power of SEO is magnified when you are dealing with niche products. With 43% of e-commerce traffic coming from Google organic search, rumors of the death of SEO are highly exaggerated. Plug In SEO offers the ability to identify weak points in a Shopify site’s SEO and suggest improvements. Another best practice is to optimize images for SEO, and SEO Image Optimizer by Booster Apps can do this automatically for you. Both these apps have free packages. Email Marketing: Email remains one of the most powerful direct marketing tools there is. Abandoned cart emails, for example, have a 40.5% open rate, often boosting revenue by 15%. It makes sense to have a personalized, segmented email strategy in place for customers and subscribers. GrooveJar contains a powerful set of apps to help you with your email campaigns along the sales funnel, converting site visitors into customers. A variety of popups use behavioral psychology (e.g., urgency, crowd influence, social proof) to encourage site visitors to take action, mainly to provide you with their email address or to purchase products outright. Once you have their email addresses, the Collect & Convert app allows you to create customized, triggered email campaigns to turn leads into customers. It’s one of most efficient lead generation and conversion tools on the market, capable of generating 9-20% conversion instead of the 3% industry average. Best of all, it boasts a five minute setup time. Social Media: Seventy-two percent of adult internet users use Facebook, according to Pew Research Center’s Social Media Update for 2016. This figure alone underlines the potential inherent in harnessing the power of social media. There are many social media integration tools available, and TrustMyStore Social offers users the ability to post on up to 15 platforms at once. It simplifies planning of a comprehensive social media strategy enabling the scheduling of posts in advance. Customer Reviews: Surveys suggest up to 90% of consumers are influenced by online product reviews. It is vital to monitor reviews, particularly negative ones, and encourage as many positive reviews as possible. Merchants often utilize post-purchase emails and social media to entice customers to leave positive reviews. There is also Yotpo, an app that makes it easier for customers to write reviews on a product they have bought. It does not filter out negative ones, so this will need to be monitored. The above are the most effective ways to drive traffic to your Shopify store and boost revenues. A targeted and personalized marketing strategy, across multiple platforms, can be a gamechanger in increasing the value of any business. At FE International, we have sold over 500 online businesses for hundreds of millions of dollars. We have developed a formulaic understanding of valuing e-commerce stores. 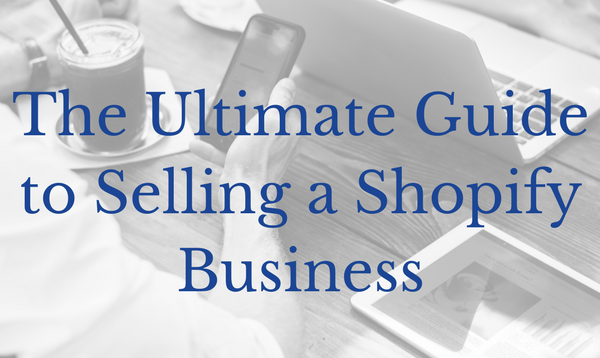 Below is a step-by-step primer on how to value a Shopify business. As the equation shows, SDE is the profit left to the owner once all Costs of Goods Sold (COGS) and operating expenses have been deducted from gross income. Important note–the salary taken by an owner is typically added back as this helps to standardize valuations across businesses where owners may pay themselves different amounts for tax purposes rather than anything to do with the complexity or time spent on the business. This model reflects the fact that most small businesses are owner operated, and thus, owner reliant. An owner will often pay themselves a salary and purchase personal items through the business for tax reasons. All of these expenses are acceptable add backs in working out the true underlying profit potential of a business. Other add-backs can cover one-time or no longer relevant expenses – for example, redesigning a website (assuming just done once) is a common add back. As this cost is not relevant going forward, it is adjusted accordingly. Age: A Shopify business with a proven track record of consistent profits will be more attractive to a buyer than one with a history of a few months. Businesses with a lifespan of at least 12 months old are the preferred minimum entry point. At two years or more they may generate a premium valuation. There is a market for younger businesses but the pool of buyers is much smaller particularly for seasonal businesses. Time: This is about owner involvement. If a buyer needs to spend over 10 hours running the business, it can negatively affect the value (particularly for very small businesses). This is why we emphasized the importance of streamlining, and, wherever possible, automating business processes. What most buyers are looking for is passive income. Trend: Buyers rarely want to purchase a business where revenues are in decline or stagnant. Consider the niche the business is in as well. If the business sells evergreen products likely to be in demand over the long term, the valuation multiple may lean towards premium. Concentration: Relying on one product, niche, or supplier can make your business vulnerable to sudden changes, like a fall in demand or supplier issues. Having multiple sources of revenue not only makes your business more profitable but also more resilient. At FE International we have a database of over 20,000 vetted buyers looking to purchase online businesses, with 95% of listings selling within 60 days. Extensive Network: A good advisor will have an extensive network of fully-vetted buyers already in place. This leads to a highly efficient buyer search process. Comprehensive Service: Selling a business is complex, particularly if it’s the owner’s first time. A good advisor will steer the sales process from start to finish. The seller provides any information the advisor requests. At that point, the advisor takes over. Typically, the services offered are valuation, sales material preparation, finding buyers, negotiation, due diligence, drafting of contracts along with other legal or regulatory matters and finally closing the deal. Simply put, a good advisor will extract maximum value from the sale of the business, with the least amount of work required from the seller. Maximum Value: A seasoned advisor will accurately determine the true value of a business using market insight, previous experience, and e-commerce valuation metrics and will know how to maximize it. Security: Reputable advisors deal only with buyers who meet a strict set of criteria and demonstrate serious interest and the requisite resources for acquiring a business. Using methods tried and tested, advisors will ensure your data, intellectual property, and other essential assets are kept safe and secure throughout the sales process, whether the deal ends up being finalized or not. Satisfying Advisor Requirements: It’s not just buyers that are subject to stringent vetting requirements from a reputable M&A advisor. Qualified sellers will need to provide a significant amount of information, much of which we outlined earlier, before being considered for representation. Fees: Any professional advisor worth working with will charge up to 15% of the final sale price. Using an advisor is particularly beneficial to first time sellers or for any owner without the knowledge or network to extract maximum value from a sale. It can also significantly speed up the process. Qualified business typically go from listing to final sale in just four to eight weeks. Marketplace: Online business marketplaces appear to be a cheap and easy platform for selling a business. With listing costs often in few hundred dollars range, it can seem like an inexpensive way to draw buyer’s attention to your business. The upfront cost may be low, but check out the fine print most marketplaces still charge a 15% commission on the sale price on top of the listing fee. 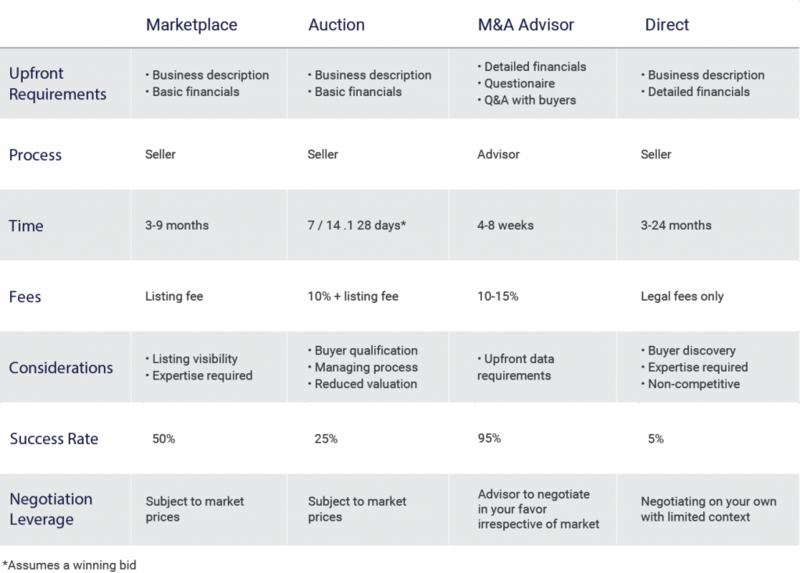 They also have far less stringent vetting requirements for both buyers and sellers than a dedicated M&A advisory firm. This leads to a corresponding drop in quality–on both sides of the sale.Keep in mind that when a business sells through a marketplace it will be reliant on the seller to do their own due diligence, sales material preparation and buyer verification. Marketplaces have their place and are generally most suitable for businesses that are pre-revenue or below $10,000 a year in income. Bottom line: businesses that have followed the steps and meet the requirements outlined above, can get much more value working with a good advisor than trying to sell themselves. Auctions: Much of the what applies to the marketplace model also applies to online business auction sites. Auction sites feature a sales timeframe that you can set, whether it’s a week, 3 weeks or a month. Essentially, it’s eBay for businesses. Direct: A business owner may feel the best option is selling a business directly to the buyer, cutting out the middleman. If a business owner has years of experience putting together deals and an extended network of buyer contacts, this may be a viable option. Without that experience, it will likely end up being a lengthy, expensive and overwhelming process. And odds are high, the business will end up being sold below its full value. Carefully explore all the options when it’s time to sell a business. Given all the hard work that has undoubtedly gone into building, extracting maximum value should be paramount. A Shopify business consistently generating strong and sustainable revenues, are attractive properties for buyers. Relatively little technical knowledge is required on the e-commerce aspect of the business and Shopify is a secure and global platform. These are two appealing factors for virtually any buyer. Track your data: Without data, it is impossible to come up with an accurate valuation of your business. Ensure you record revenue, web traffic, and customer data from day one. Standard Operating Procedures (SOPs): Clear and efficient SOPs are important to the smooth running of the business and enable the new owner to take over seamlessly. Outsource: Buyers are looking for passive businesses where the owner does not need to put in any more than 10 hours a week running the business, so where you can, outsource tasks to freelancers or delegate jobs to full time employees. Add-Ons: The Shopify platform gives you access to a huge number of extensions that can make running your business easier, including areas like marketing and accounting. Timing: Buyers want to buy businesses with growth potential, so you should sell your business with a good history and positive forecasts. Sustainable: It is important to demonstrate to buyers that your business is not overly reliant on one niche or product. Diversify to find more than one source of revenue and build a stable, strong business. The end goal is to have a passive, profitable, and sustainable Shopify store, operating in a long-term niche. The key is to know your business and fully understand the valuation drivers. Following the above steps will steer you to creating a sellable business that buyers will be interested in buying at a premium. This is why it is critical to gather and monitor data coming in from day 1, including web traffic, revenues, customer numbers, and sales, among other metrics. The data gathered will give you an overall picture of your business, and in the months before the sale, identify underlying issues and enable you to fix them. Those solutions can be found in a number of areas we have covered in this post such as SOPs, Shopify App Store, or marketing. The key is to know your business, knowledge is power. This is not a process that can be done hastily, take the time to understand the value drivers, how you can maximize the salability of your Shopify store, and identify the factors potential buyers are looking for. Ensure your business is not overly reliant on one source of income and operating in a sustainable niche. Buyers are looking for long term potential, so if your figures show a spike in revenue, you will need to be able to explain this and address any concerns that you may have reached the top of your market. Timing the sale of your Shopify store is critical, as you want to be able to sell at a time the business has a history of sustainable growth and is forecast to grow long term. As you approach the end of your exit strategy, your Shopify store should be a passive business, with internal and external processes running smoothly, so the new owner can simply come in and run the company. It can also be a wise move to hold back on new products and leave them in the pipeline as a bonus for the buyer, and therefore, increase the value of your business. The message is take your time. Evaluate your options and seek advice from across the industry. Shopify stores are sought after businesses, and maximize the potential value by taking the steps outlined in the post. If you’re thinking about selling or are just curious what your business is worth, it’s never too early to start talking to advisor and getting a valuation. Please fill out this form if you are interested in a free valuation for your business and more tailored exit planning advice.